This linky party has been going on a while but when I found Christina's blog Bunting, Books, and Brainbridge -- I knew I had to link up! 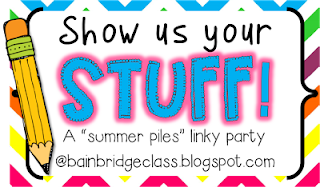 This party celebrates all our "stuff" we collect over the summer! Click the image below to join the party! I have "stuff" scattered around our house...from projects in the office, the front entry way, and the garage! In addition to new stuff, I have two full boxes left over from summer school that need to be hauled back into my classroom. Here is entry way/ living room after a trip to Target, the used book sale, and some great finds at my mom's house! Don't forget to link up and show us your stuff! Last Made It's and Must Haves of July! Back to School: Must Haves! An Award? For my little ol' blog?! Let's hear it for... Homework! Favorite Pins Friday & Giveaway! Rules for Otters... Say What?